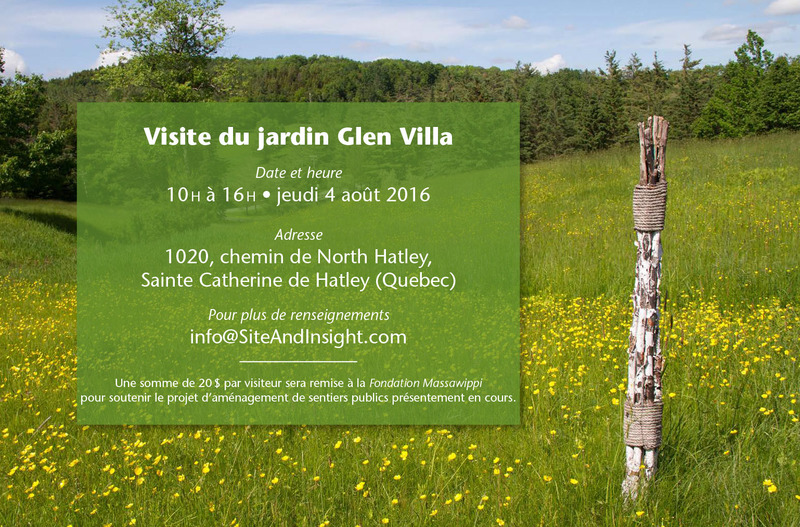 For the last few weeks, everything and everyone at Glen Villa has been focused on preparing for the first (annual?) 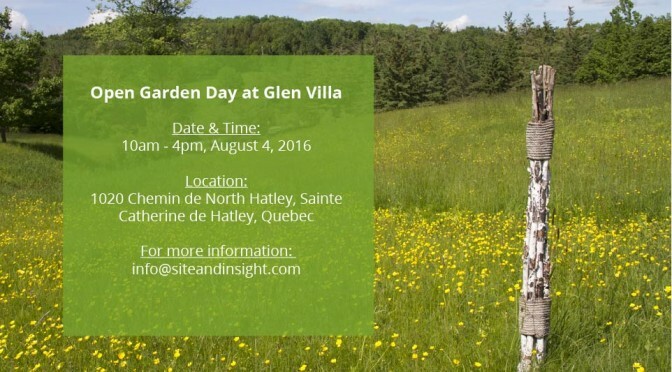 Open Garden Day on August 4. Twenty volunteers are primed and ready to go, each assigned to a three hour time slot and to a specific area in the garden. When one of the volunteers asked me which area of the garden was my favourite, I was at a loss. How can I pick one place when I love them all? The history associated with the China Terrace fascinates me. The China Terrace is an imaginary recreation of Glen Villa Inn, the large resort hotel that once stood on the property. The clean lines of The Aqueduct give me pleasure every time I look at them. We’ve had very little rain in the last month or more, so water is only trickling through the elevated channel and falling down chains into the reflecting pool. 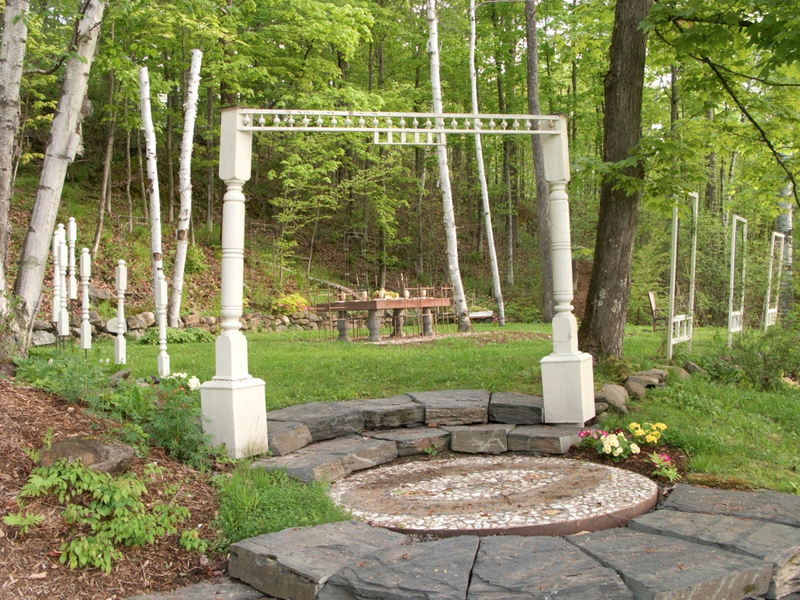 Even so, there is enough to give the sound of water that prompted us to build this feature. The transformation of the Big Lawn into the Big Meadow is a joy, particularly when the wind blowing across the long grass seems to turn dry land into an ocean of never-ending waves. 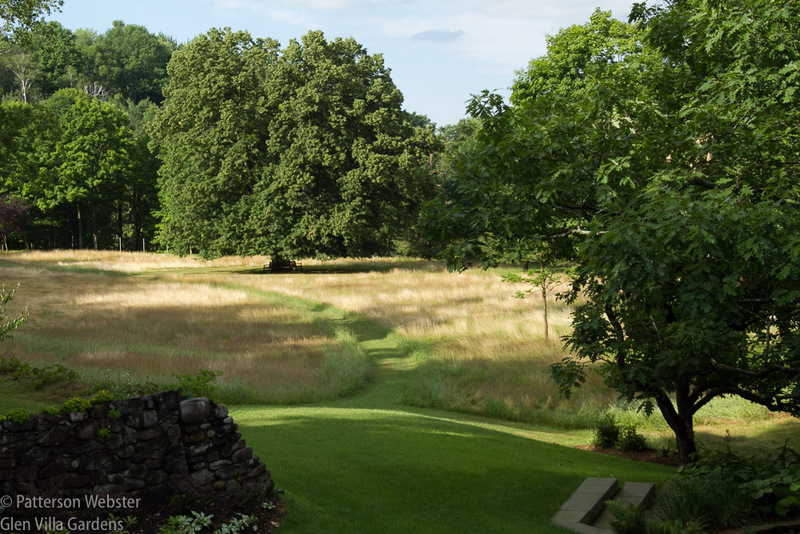 This recent view of the Big Meadow shows how beautiful uncut grass can be. 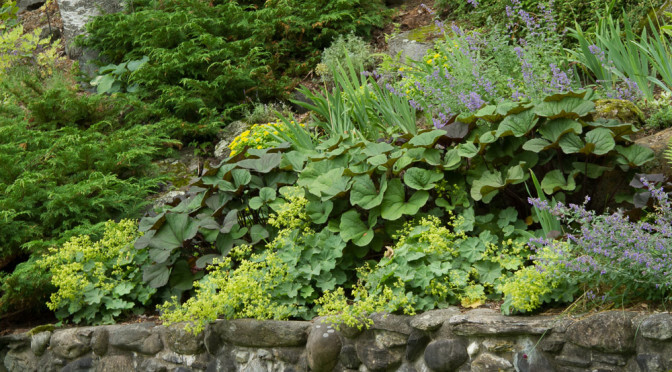 The Lower Garden is full of flowers in bloom — at least when the deer decide to browse somewhere else. 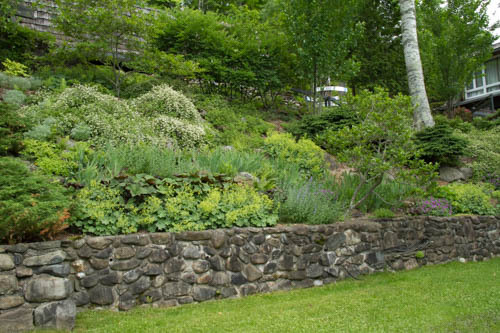 This side view of the hillside in the Lower Garden shows the stone wall that was part of a summer cottage that once stood at this spot. The Asian Meadow is quiet and peaceful, a good spot to sit and regard one of my favourite pieces of sculpture in the garden, Bridge Ascending. 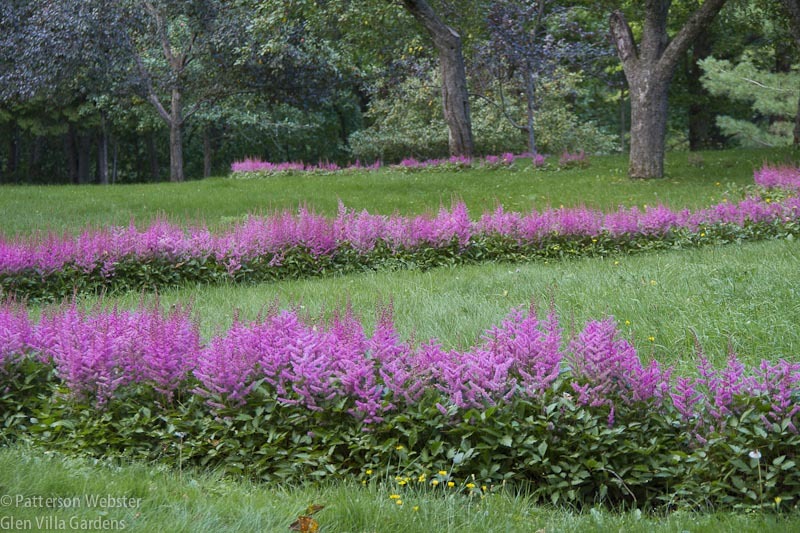 I love the view down onto the Yin Yang from the Dragon’s Tail, where a whip of grape hyacinth that blooms blue in the spring is replaced by a whip of pink in late August, when the astilbe comes into bloom. The dragon’s tail in August is a scribble of pink across green grass. I like the symbolism of the Yin/Yang, where aspects of our family’s history are brought together with a philosophy of life. The Yin Yang presents a series of contrasts, in colours, height and texture. The spot of Artemisia added to the non-living brick gravel side and the painted tree branch added to the living side illustrate the idea that nothing in nature is one thing only, and that every part of life always contains within it a piece of its opposite. I love the house we live in, its strange and beautiful architecture and the way it sits so comfortably on the land. 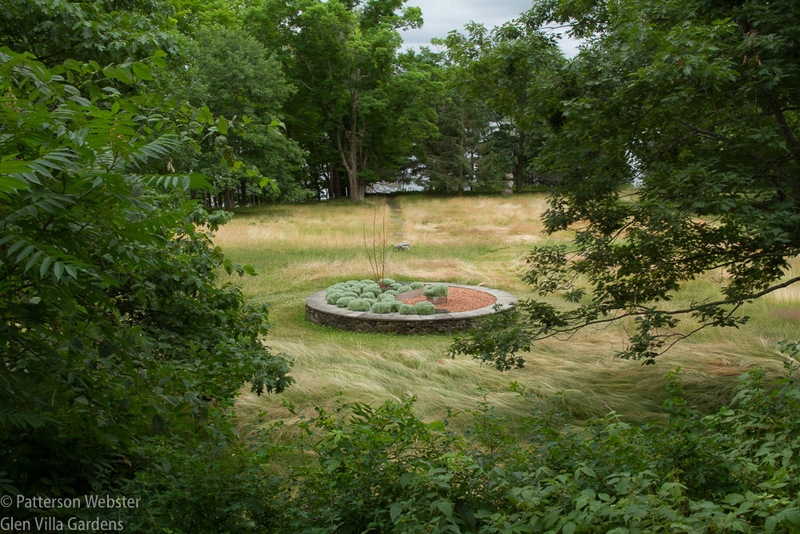 I love the view from the log terrace beside the house, looking out over the lake, or looking toward Tree Rings, the sculpture I made last year to honour an old maple tree that gave shade to the house for a century or more. 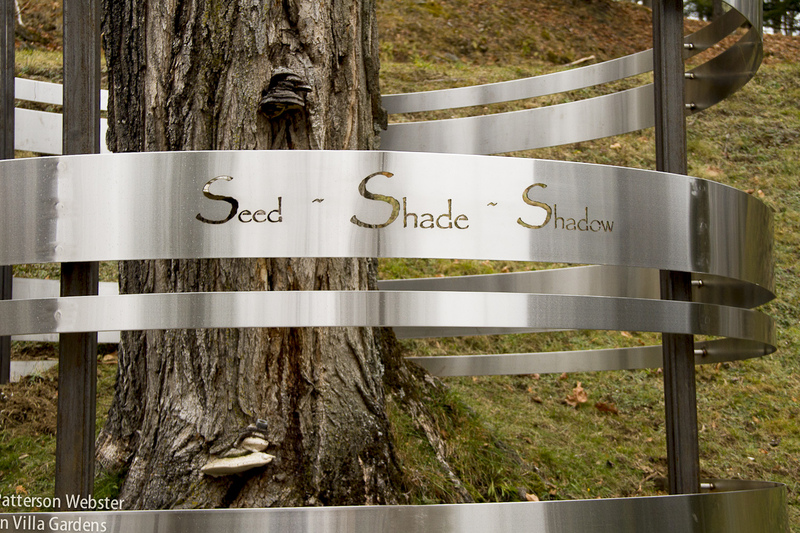 Seed, Shade, Shadow: the life of the tree. And then there is the Upper Field and the Skating Pond. So much goes on there. 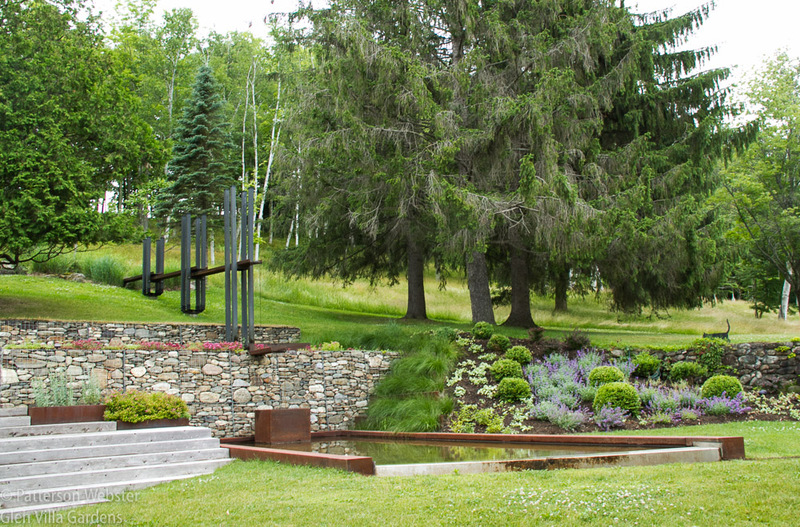 Bridge Ascending, the extraordinary sculpture created by the internationally renown sculptors Louise Doucet and Satoshi Saito, marks the entry to the field. 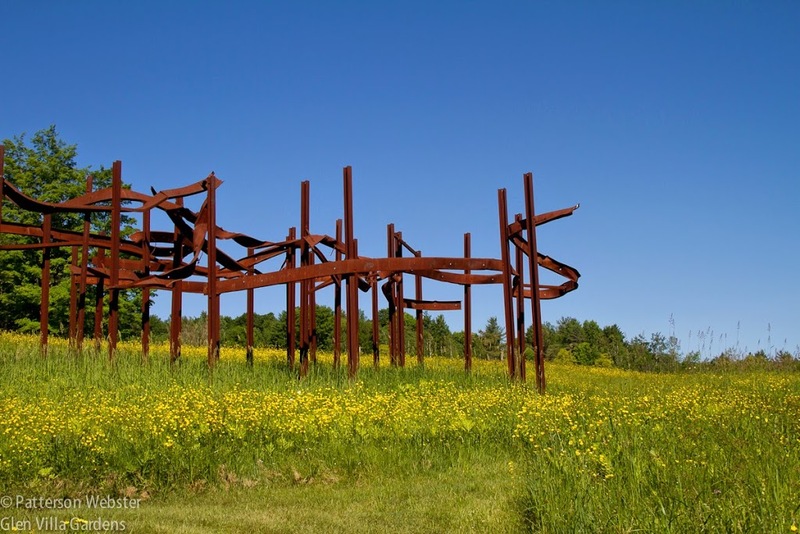 Abenaki Walking, the installation I made to honour the original inhabitants of the land, moves through the field, connecting the past to the present day. The shrub borders are full of colour and beauty. The Skating Pond is full of ever-changing wildlife, the buzz and scurry of insects, the croak of frogs, the slow-motion swim or motionless lounging of a very large turtle. 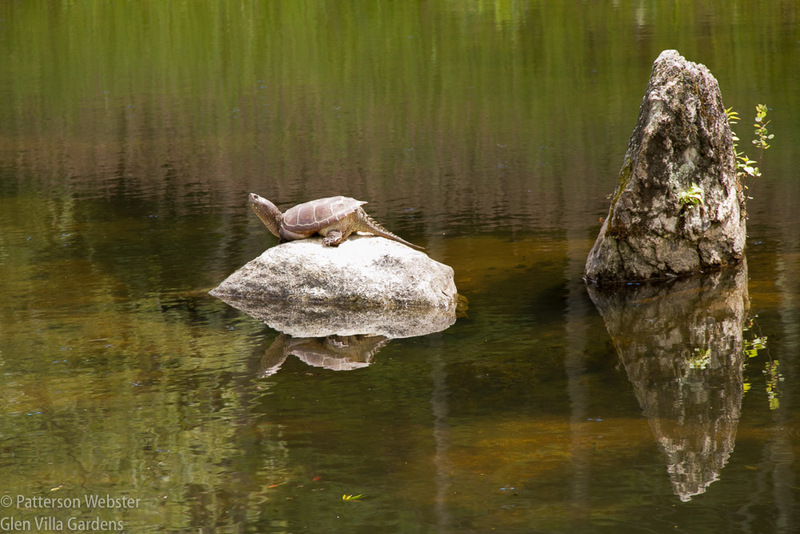 A few seconds earlier the turtle was resting quietly. I made too much noise and alerted him to my presence. A minute later he slipped back into the water. How can I choose a favourite spot? I love them all. Next week when visitors arrive to tour the garden, I hope they will use the brochure and map we’ll provide to explore every part of the garden — these areas and more. I hope they will find the visit stimulating and enjoyable, that they will leave with a head full of ideas and a heart full of the peace and joy that nature offers to those who take the time to look. Whatever language you speak — French, English, or the language of the natural world itself, you are welcome. 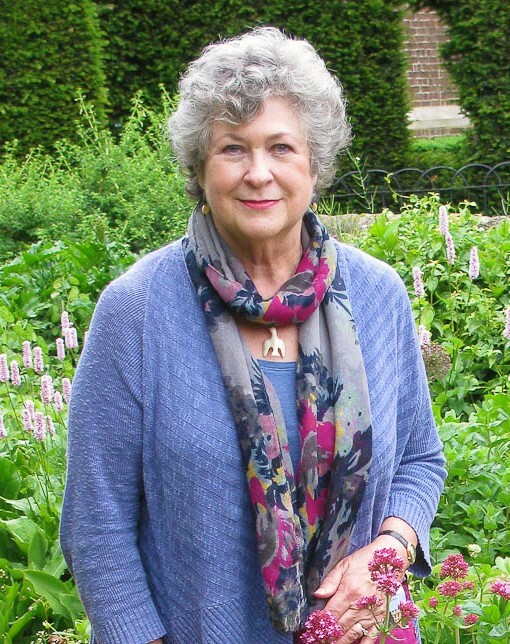 Getting Ready for Garden Visits: It’s time to panic!